We flew from Perth to Adelaide (on Virgin Australia) and arrived there on the 14th November. 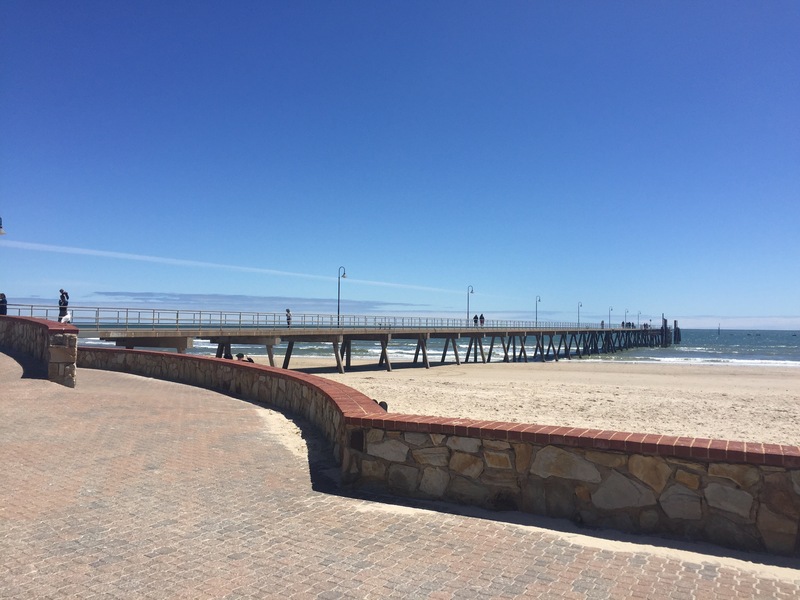 For us, Adelaide was a stop off between WA and the Great Ocean Road. We then had 2 days to explore the city before we hired a car and headed for Melbourne. We had been reassured by travellers and people from Adelaide that this was enough time to see the city – it isn’t like many of the other state capitals (such as Perth and Melbourne) where they have a large tourist industry and so have a lot advertised and catered to the tourist market to see and do. Adelaide is a lot like a normal city at home, except a lot bigger with wider streets. That’s not to say that Adelaide isn’t lovely, it’s a really nice city and is probably a great place to live – really pretty with lots of Art installations around (something I have noticed with all of Australia)! The hostel we stayed in was full and I overheard the owner say it was fully booked until April so it’s definitely a popular place for travellers to go. We had heard that it was a very common place to come to work and save money as there wasn’t as much to do as other cities and there were a lot of jobs (so you’d save loads). A strange thing that takes a bit of getting used to when travelling Australia is that the time difference changes a lot. Adelaide was 2 and a half hours ahead of Perth so it was late afternoon when we landed. A lucky thing about our flight was it was in the morning and had meant we had gotten up at 6am to get ready, get to the airport and board – this meant we were very tired and so it made adjusting to the time difference easier. We started our first day wandering the city and exploring. Adelaide was the first city that we had encountered being decorated for Christmas. There were Christmas lights and decorations along the streets and – what was probably the most strange considering it was sunny – there were Christmas songs being played out of speakers throughout the shopping district. I don’t think I’ll ever fully be able to get used to a hot Christmas! One thing Adelaide has a lot of is parks. We went to the main park named Victoria Park which was huge and had a large focus on exercise. There was a cycle race track, a running track and then, dotted throughout the park, there were areas and instructions to do different exercises. This was called the sweat course (I think that was what it was called!) and it went all along a track – which was used by a lot of runners and walkers – and had everything from stomach crunches, hurdles, pull ups and bar lifts. It’s a very clever idea and I bet would be great for going to the park to exercise with friends or just making a run/ jog a bit more interesting! 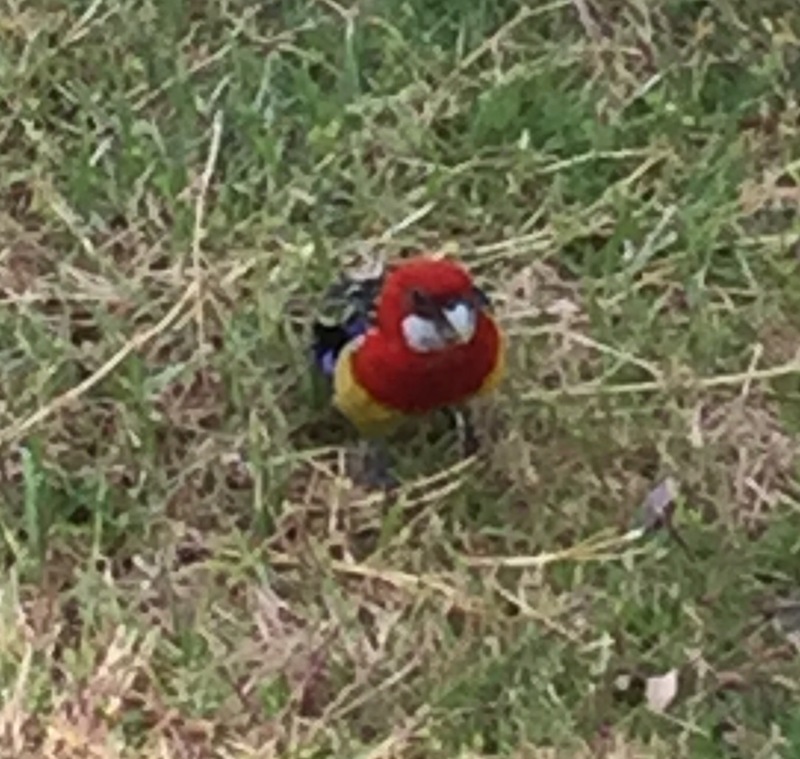 Another great thing about the parks and, really, all grassy areas in Australia, is that there are lots of parrots. Instead of the green parrots of WA, Adelaide had red and blue parrots throughout the trees and picking at the grass – definitely more exciting than pigeons! In our only full day in Adelaide we visited one of the Botanical Gardens (apparently there are two – we went to the one in the city centre near the hospital) which was lovely. There were nice open spaces and a green house with a giant Lilly pond in it. The Lilly pads were enormous and apparently the greenhouse was one of the first places to display water plants. There was also a giant greenhouse housing a rainforest – thankfully none of the bugs that you’d normally find in a rainforest were there! Our final stop was Glenelg which is their coastal town and is a tram ride out from the city centre. This was a really nice seaside town and it got nice and sunny when we arrived there. Despite the sun it was still windy which made it a bit colder but we still had a walk along the jetty and beach before relaxing in the sun. We ended our day with chips (for me), a hotdog (for Niall) and ice cream (for me, although Niall did have some of it) – it’s the beach after all so that’s a must!). Overall it was a lovely way to spend our days in Adelaide. Our hostel served pancakes for breakfast so, as we couldn’t pick up our car the next day until 12 noon, we were able to eat a lot of pancakes, do a food shop and get some tips on where to go next by the great hostel staff before we left Adelaide for the Great Ocean Road!